ALL WHEAT AND ALL SPRING WHEAT ACREAGE,YIELD. ~r '. f ,,~'' ^ SEEDED ACRE "" ""
80.81 million acres seeded for the 1937 crop. spring wheat. This is about 4 percent 1n.' the 13.5% million acres seeded in 9I'ji . recent years. Present prospects arr f-ir '* e rouc.tinn of a near-record crcp In 1949'. percent and in the soft red winter region 2-1/2 percent. and probably average at about the lon 1Dr the :,Lareting year as a wh le. rate for the 1948 crop was $2.23 per bushel. prospective spring acreage, atout 1,. million buishnl would b'e produced. 1949-50 and. for addition to the carry-over July 1, 1c c0. the all-time record high of 631 million in 1942.
concerned, the Agreement will &o into force not Ieter than Septemter 1, 1949.
estimated at 30nl-325 million bushels. lion bushels of heat undrr loan or purchase agreement Mill be delivered ..
to CCC followinC the April 30 expiration date. As a result, the carry- . over on July 1 rould bc :mostly CCC owned. If free market supplies should ..
wias an announcement whichh established a pri'e floor, below which CCC could . (3) a price halfwa:,- bctrv-n th. support price and parity. not yet been restored, and in 1948 vas only abcut 30 percent of prewar. for the 1l'49 crop may be somc-.nrat lo'.cr than for the 1948 crop. bush.cls, or about 2 million bushels b,_lov: last year's record crop. and for addition to :.he carry-over July 1, 19P0. 2/ The first indication for sprin,'- -hrat . 'ill be issued on June 10.
national affairs will continue to be very important in detennLning thr. quantity of United Status exports. interest of the best long-time u-'i of :.oil resources. vious record of 80.0 million acres in 1937.
cent below 1948, and that in the Pacific 1'ortht:cst 21.4 pe.rcirnt below. : 1949.
generally lower-yielding than winter varieties. of relatively more favorable returns from other grains and from livestock. France and Italy is reported to be approximately the same as in 1948.
during early March provided at least temporary relief in most areas. acres or 8 percent compared with the acreage seeded in the fall of 1914'. adversely the 1949 moisture supply. to carry out as effective control methods as possible. 340 million bushels in 1908 and the 1935-39 average of 370 million. and probably average about at the loan for the marketing year as a whole. .would be $1.96 compared with $2.00 for the 1948 crop. were much larger than at the beginning. the 30's and the war curtailed shipping in the early 40's. of net imports, net exports averaged 169 million bushels. again became an important price factor. and 95 million for seed. carry-over cf 300-325 million bushels is indicated fcr July 1, 1949.
parity price; and (3) a price halfway between the support price and parity. over half of the flour for export has oeen purchased by the commercial trade. to within 6 cents of loan level on July 7: CCC purchases heavy. ing urgency of maximum exports; purchases for export July-October seasonally heavy. prices continued ver, high inrelation to prices of livestocki and livestock products. (a) Marked improvement in crop prospects was reported for most importing countries. CC' purchases -hich started in March. continue large, reaching peak in July. late December price level maintained to mid-Januar, at about 3 cents above loan. 1, 1945 and arch 31, 1948.
under the provisions of the Prairie Farmers' Assistance Act. cultivated acreage up to a maximum of $300. $32,000,000 had been collected under this levy. 2. Maximum and minimum prices are fixed for en.ch of the four years. a.: prices no locwr than +he mini.m:um. for erch country for each of thc f'ir years of the Agreer.:rt. at the minimum prico th, quantity it has guaranteed t,. buy. tLat date, the foregoing prices also represent U. S. currency per bushel. repr.senitativi.s of 3 exporting countrir.s and of 3 importing cointrics. vr. th the. prict-s fixed for what. Exporter 7uro.o : C -on_- e-11 C 4r:"
are based on the basic minimum .rico for th'. first year of lhe Agreemcnt. countries, together with their guaranteed purchases arc shown in table 3.
untcr into force between those go-. 'crnments which have accepted it. in July At that m.ceetipg the Council will select its dffi'etr's and. of relating quantities of wheat-flour to the quantities of wheat specified. SIncludes food for both civilian population and the military force's. 1932 : 6 2-31 .1.4 756,307 Z-',F3 1. 1935 : '',811 .3.0 6.9,2'27 ..... 7. 149 T : 73 ,536 1 1i 1,1,?,046 ),541 14..
1943 : 77,749 16.-. 1,: ,4, I> 5' 1.if.? 1/ Figures for duriur r-.pres.nt thrc,. u~ m 2 "_ 0 -j: ^11' ? : _Durum. 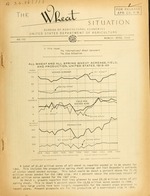 2Z : ot h r ring ..
1/ Data for 1929-38 in The Uih.at Situation, harch-April 1'-43, page 11. / North Dakota, Montar.a, South Dakcta and Minnesota. Kentucky, Tennessee, Maryland, South Carolina, Georgia, and West Virginia. / Washington, Oregon and Idaho. December 1948 winter estimate and March 1949 spring prospective plantings. In grain equivalent, wholly of United States wheat. 2/ Ireland included. Table 10.- '.7.cat: "Woghtccd. av rage cash prico, specified markets . date m arkots Winter "
; 1948" 1949 :1948 ;1949 ;.948 -1949 : 1948-1949 : 1948' 19^.9 1948'1049 i.
Dol. Dol. Dol. Dol, Dol, Dol. ./ Avcrago of daily cash quotations. Table 12. -. h.--.t: -. 'ric -. s 'LI"
MARCH-APRIL 1949 24 : . BACKGHJ'C'IDc- Th.. riiec acruagc in 'J.e United States 1o4"
in 1948, Considered from "hc standpoint of supply, the . States produces only about 1 percent of the total. How..
but arc below the all-timo hith luvcl for the.- 1947 cror. (tables 14 and 15). lo":er than for thu 194S crop.
. million l.ushcls below last year's record.crop. 5/ Other than thec class called brxewcrs rico. which is usually available from the country. country is now importing rather than exporting rice. exception of India and Pakistan, is not yet up to prewar levels. pose the problem of increased needs. 100 pounds of rough rice, converted separately for the Southern States and California. lmnth of July are not much different from one year to another, the use of the July year to Justifiable. 6/ Includes exports of rough rice in terse of milled equivalents. in occupied areas measured at time of procurement not at time of shipment overseas. j/ Balancing item results from drying loss, vwate, and errors in data and conversions. 1O/ Bag equals 100 pounds. II1 Preliminary. 1&42.. 11,00 P 8d. 0 : 8..3 ..i.s 17.1 3: 9.5 :9.3.' U,9. Data from Production and M!arket-tg Adman .sLraLion, U, 3. D. A.
Aug. D o : : l D D D Dol. SDol, ol, Dol. Dol. Dol, Dol. Dol. Dol. Dl Dbol. Dol. Dol..
: Dol. Dol, Dol, Dol. Dol, Dol, Dol, Dol. Dol, Dol, ola, Dol. 1946 vas revised from $3.67 to $3.412. Compiled in the Of'ice Gf Fo.reivr. A.gri-ul.ural ..-5t..Jls. milled at 70 percent, and for other *-'unt.riWs :.L 5S perT'ant. P/ Preliminary. WAS!TINTON 25, D, C. payment of postage $0SB L .
1946 : 1,331 255 1,586 41.2 66.1 54,632 17,584 72,216 . 1949 3/: 1,491 262 1,753 (79,000):. 300 in 1925, 610 In 1926, 75 in 1927 and 400 in 1928. 3/ March, 1949 Prospective Pl14tings.